Today’s recipe is one that was one of our favorite law school recipes. I haven’t made it since the law school days and had all but forgotten about it until I saw Amy’s recipe for Ham & Cheese Pockets. Since our budget was so tight when Jesse was in law school, I only made this recipe when I was able to find ham on some amazing closeout price. Every once in awhile, Dillon’s would have it marked down to $0.49 to $0.99 for the small packages of thin-sliced lunchmeat. I usually had a coupon to pair with this deal, so I rarely paid over $0.50 per package of lunchmeat. I could stretch one package to 5-6 Ham & Cheese Pockets and they were a special treat since we didn’t eat a lot of meat during that season of life. 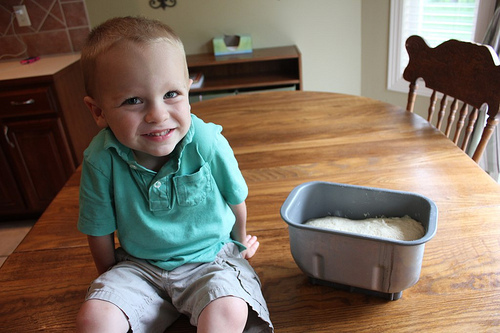 To make dough in bread machine: Add ingredients in the bread machine in the order listed and run on the dough cycle. Check about halfway through to see if you need to add a little extra water or flour to make a soft dough. To make dough by hand: Dissolve yeast in warm water. Stir in salt, sugar, and dry milk. Add flour and stir until dough pulls away from the sides of the bowl. 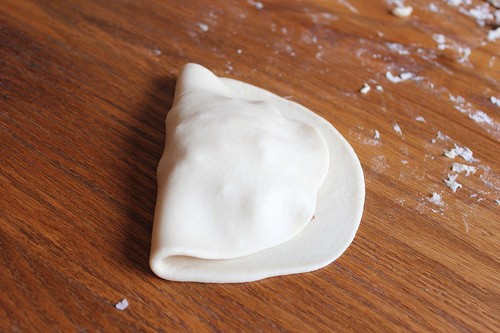 Dump dough onto a floured surface and knead for around 5 minutes, until a soft dough forms. Add a little more flour, if needed. 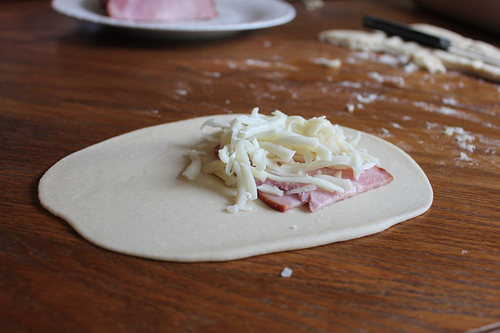 To make Ham & Cheese Pockets: Divide dough into 10-14 balls. Roll each ball into a rectangle. Put ham and cheese on half of the rectangle. 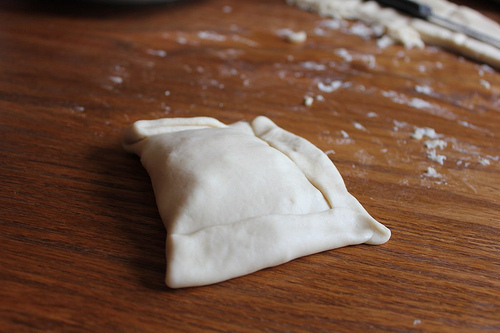 Fold dough over and pinch sides to seal tightly. Bake Pockets on a greased cookie sheet at 350-degrees for 15-18 minutes, until lightly browned. To freeze: Let cool completely. Freeze in airtight ziptop freezer bags for up to 2-3 months. To serve: Remove desired number of pizza pockets from the freezer and warm them individually in the microwave for about two minutes or until heated through. Or, warm on a cookie sheet in a 350-degrees oven for 20 minutes, or until heated through. These look delicious! I have made something similar with puffed pastry before, but can’t often justify that expense. I am definitely going to try these in my next round of freezer cooking. I have leftover ham from Easter in the freezer which will dice up nicely to go in these pockets. Thanks for the inspiration. These look yummy! What about adding some honey mustard? Anyone try that? that sounds good, I was wondering if anyone has tried adding spinach? I make ham and spinach stromboli (from the looks of it, same thing as this). I use baby spinach from my garden torn into little bits. I also add cheese and garlic powder. It’s really good. My husband dipped his in dijon mustard last night and said it was excellent! I got “brownie bite cookie dough” in the freezer, and some more beans cooked up http://snailpacetransformations.com/2012/05/11/4-weeks-to-fill-your-freezer-day-9/ . I am going to have to try your recipe, I know my husband would love these, and they would be easy for him to eat at work. I’ve made these (ham & cheese), also turkey & cheese, and then meatball/ground beef, spaghetti sauce, and mozarella cheese… Those are probably my fav! These sound good. I have some small-diced ham in the freezer left over from Easter; do you think diced ham would work well in these? Ooh, and our neighbors gave us a jar of their homemade banana pepper mustard, which would be a wonderful dipping sauce for these! Thanks for the recipe, Crystal!! Yes, diced ham would definitely work! I tried some with diced and some with sliced ham when I made these this week. The diced ham was easier eating for my little ones, especially the one without front teeth! I made the freezer burritos last night to put in my husbands work lunches. It was my first attempt at freezer cooking and I am really excited about how easy and helpful it was! Thanks for the recipe. It inspired me to challenge myself to 5 days of cooking “real” foods. Today I’m going to make homemade granola bars. I’m so glad I found your website. I love your story! Can you sub anything for the dry milk. I don’t have any of that? If I’m remembering correctly, when I’ve made these before, I sometimes have left that out and used some milk instead of water in the recipe. These look good, but I don’t eat meat. Anybody have any suggestions for what veggies would be good in the pockets to replace the ham? I think mushrooms, peppers, and/or onions would be my first choice. You could also do something like chopped broccoli and carrots (maybe lightly steamed?). I have made these before with broccoli and carrots (lightly steamed, like you said) as well as with a bit of alfredo sauce. they turned out very well. Broccoli and Cheese would be so good. I think spinach and ricotta would be good too. Or just plain cheese. Oops, I did the linky wrong 🙂 Rookie! I added just my first name. In any case, loved the pizza pockets! We ate some for dinner and now my little one is really excited to have them for weekday lunches. I plan to make these ham and cheese pockets on Monday since our weekend is packed. Thank you SO much, Crystal! Love these 4 weeks challenges in particular this one! These look so yummy! What kind of flour are you using? The other day I made 2 dozen more meatballs, and last night I made a double batch of pizza dough for the freezer. I had meant to make your pizza pockets with half the dough, but forgot to buy pepperoni (my family’s preference). So, I made meatball pizza instead 🙂 The pizza pockets are on my shopping list for next week now! Sounds like you were really productive! I made homeade egg mcmuffins for the freezer yesterday. Could you post a vlog of you making the dough? Haha that’s funny. 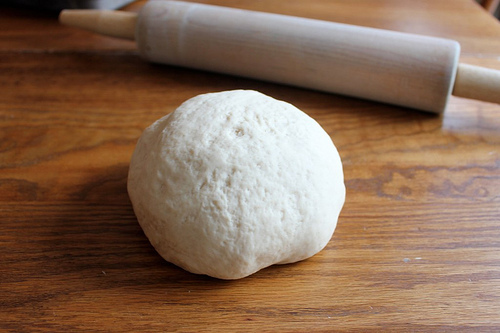 Your dough always looks so very smooooth, btw. Has anyone ever filled these with scrambled egg and ham? My kids love the breakfast hot pockets, but I rarely buy them. Will the eggs freeze up well? Any input would be great! These look yummy, but I am always looking for something quick for breakfast! That sounds so delicious! Let us know if you try it! I’ve frozen breakfast burritos many times that have scrambled eggs in them. They freeze just fine, and are delicious! I think it would work just fine, you may run into an issue with extra liquid from the eggs when defrosting, though (that is my problem with Egg McMuffins, and sometimes the bottoms get soggy.) It’s definitely worth a shot, though, since it sounds delicious and much healthier and cheaper than storebought! Looks great! I don’t eat pork for religious reasons, but I bet I could sub turkey ham or even turkey pepperoni and it would be good. Yes, you definitely could and I think it would still be really yummy! Crystal, one question: what size should the rectangles be? The thickness of the dough will make a difference in baking time! Mine were around 8″x5″ or so. Those sound really good! Just wondering if the yeast is really supposed to be 2 TBSP, though, since that would be almost 3 packets worth for only 3 cups of flour? I’m thinking I will make these for lunch using leftover taco meat and Mexican cheese blend. It sounds like a lot, but it’s accurate. If you’re game, you can try using less, though, and let us know how it turns out! Thanks for answering. I made them before I saw your reply so used 1 TBSP of yeast. I’m not freezing them, though, so that may work out okay. Crystal, your children are so beautiful. I love to see how happy they look in the kitchen with you. I remember when mine were “littles” and loved to “help” me make various dishes. Just the other day my daughter said she thought I always baked and canned because I loved it. lol….saved us a lot of money! I make something similar but use gouda cheese, broccoli, and pepperoni then dip in pizza sauce. 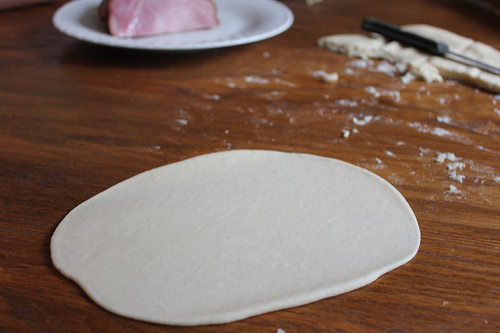 I also roll out the entire dough into a huge rectangle and use a pizza cutter to cut into smaller rectangles. Then it is easier to assembly line filling the ingredients. I was wondering if you’ve ever tried this recipe with wheat flour instead and if it worked out? Thanks!! I think it would definitely work — or you could try half and half. I am planning a freezer cooking marathon in preparation for a visit from our oldest daughter and her fiancé, from California, in July. The occasion is her bridal shower, and they will be here for a family birthday and the fourth of July as well.I am doing the majority of the food for the shower, so there won’t be any time left to cook regular meals, breakfast breads, etc. as I also work. I have my menu plan in place, but I am wondering, for breads, main dishes like chicken casseroles, and desserts such as cakes and cheesecakes, how long will they freeze without losing quality? I am considering investing in a vacuum sealer, any thoughts on those? And I apologize if this has been addressed a million times already! I’m not a rookie at freezer cooking but I’ve never stored anything for longer than a couple of weeks. I’d like to start this project now, to be eaten in early July. I personally love my vacuum sealer, since many things can be stored for 6-12 months without losing quality, but there are some things (like casseroles, lasagnas, etc), that are not really conducive to a vacuum sealer. We have definitely gotten our money’s worth from our vacuum sealer, since I like to buy meat on sale and store it. But, I know many people who use freezer bags and are happy with it. It depends how often you will be eating from the freezer and how long you expect to keep food in there. Congratulations to your daughter. What an exciting season of life for her! Sigh. Maybe someday… But my two attempts at tortilla-making were similar to my refried-bean-making efforts and my poptart-making efforts. Namely, a lot of work, for little to show for it — and an end result that was less-than-exciting. The re-fried beans on the other hand are pretty easy – just make a big pot of pinto beans with some chopped onions, chili, salt, pepper and garlic powder, and then vita-mix them. If you don’t want to clean out the vita-mix, make a “soup” at the end with the bean remnants. Then freeze in baggies. I tried making the homemade poptarts as well. I was not very happy with them. They were a little too time consuming to make and my son didn’t like them at all. But I made your cinnamon rolls and chewy granola bars on the same day and they were awesome! Are you still baking gluten free for one of your family members? If so, how are the dealing with all the wonderful baking smells in your home? I really like the idea of these pockets and other recipes like the burritos. Even moms who stay home are very busy and this could help with super busy days. I was looking at your recipe yesterday and thinking I did not like the white flour, but atleast you know what you put in it and it does not have chemicals and preservatives in it. You should be able to make it with whole wheat or half and half. Sounds like you’ve got an ambitious plan today! Here’s to your productivity! I was wondering if you could use the bread machine dough for these or your pizza crust one you used for the pizza pockets or interchange either way? Do you prefer each crust for the recipe it went with? I like the different tastes of the two crusts — but some of you might find you prefer one over the other. I’d love to hear your thoughts if you try them both! I wonder if you could use meats like roast beef, pastrami, etc, the way they do for store bought hot pockets. Wouldn’t want to eat ham every time. Have you ever used meats like these in this recipe? I think other meats would work great, too. These look sooo yum! We do something similar with ground beef and some cheddar cheese. Family loves them! Thanks for sharing. I love these home baked easy menu plans.This is going to help me out a lot! No time t make the dough? Try using canned biscuits (flaky or regular) which are always on sale for little to nothing with coupons. I have made (freezer) fruit filled pockets that have made many a hit in my home. Last month was strawberry season. Being I live in very humid SC, they mold very fast in the fridge if not used within a few days. After using them on my cereal mornings, I then spread the leftovers on a parchment lined cookie sheet, until frozen, then portion them out into freezer bags for further use! Do the same for blueberries, peaches, melons etc. If I freeze up a large amount for cakes or pies, I’ll freeze them as above, then use my “sealer” (sure got my monies worth with THAT purchase!) to be used in the next 6-9 months. Works like a charm and taste as fresh as ever! and yes…my husband loathes the words “blog” and “pinterest”… UNTIL he eats one of my new food successes and then he loves it! I have this recipe printed out to make! I printed several of the lunch recipe ideas. I haven’t been feeling good, so I’ve only made one so far. Hopefully, I can soon get the others done. We farm and with wheat harvest approaching I had been wanting to get some stuff in the freezer and these lunch ideas have been a great inspiration! I made Cheeseburger rolls. I only had ham that was frozen so I was not sure about thawing it and then refreezing the ham. My son just loves the cheeseburger rolls and they freeze really well. I am going to try the ham and cheese pockets the next time I get ham on sale. My husband was asking about the burritos today. He loves having homemade items to heat and eat out of the freezer. This is the perfect thing for me to try as my first freezer cooking…I have ham strips in my freezer-my hubby gets a coupon for $25 off John Morrell meats-only one store in town carries the brand and even then there is a very limited selection so I end up getting a bunch of ham-diced, cubed, steaks etc for free. What a great thing to use it for!! I am excited to use up some of my frozen cheese as well…I can clean out my freezer and fill it back up! i lived in PA for a while and remember a sandwich popular in the delis there with, grilled eggplant. I think it would be awesome in these, just wish I could remember what the sandwich was called!! For once in my life I did not procrastinate and the results were hilarious. I baked a ham on Monday and had planned ham sandwiches for Friday. I saw your blog and decided to try the ham/cheese pockets. I went to the other website and printed the recipe. Friday came and I dug out the recipe. It wasn’t for the bread machine, but not to worry, I had made other recipes in my bread machine that really weren’t for it. I got it in and came back a little later. Hum- it seemed to be rising quite well. I returned later to find it had already filled the pan. I began to be concerned. As the end of the dough cycle approached it was touching the top of the window in the lid. I began to think of the music in the scary movie and the monster that ate my bread machine. Finally, the timer rang and I dug (yes, dug) out the pan. I rescued the dough and finished the recipe. It was delicious; however, I see that you have a different recipe posted now. I will try this probably more bread machine friendly recipe. But I will not forget the day the dough ate my bread machine and maybe think twice before I assume any recipe can be made in it! If your a mother everyday brings a reason to laugh. I made these tonight! I used the jumbo canned biscuits from Aldi because I don’t do well with yeast and was too tired to deal with it! My husband LOVED them! They smelled so good too! He ate 4! I can’t even freeze any because he’ll have them gone in two more days of lunches! Thanks for the great recipe! anyone know if these would work if I used Bisquick mix for the dough? Like I said…yeast….to me is a scary word! I made these this weekend. I used my own dough recipe (King Arthur Classic Sandwich Bread recipe), and filled with leftover ham and a mix of sharp cheddar and provolone. They were delicious. I just made these with two teaspoons of yeast. They are yum yum yum yum yummy! Thank you! I make these often w/rolled out refrg. biscuit dough. They are the perfect size for small kids. I also add a little mayo & honey mustard w/ the ham & cheese & sometimes I throw in some chopped broccoli. YUMMY! I have been really motivated with your series. Today I even made a homemade loaf of bread. I was intending to make one a day and freeze some but it was so warm and delicious I decided to just eat it right away. I’ll try the pizza pockets and ham and cheese pockets this week. Thanks for inspiring me!! can i make these with pizza dough? Would it turn out the same, kinda like a calzone? I have some fresh store made dough and was going to make pizza, but these look like they be a hit in our house, with ham, pepperoni and green peppers or meat sause and cheese. You could try leaving out the powder and then substituting almond milk for the water. Let me know if you try it; I’d love to hear how it works! These look like a great plan for my crew. Am I right in thinking you don’t let the dough rise at all? This may be my new go-to recipe to use up leftovers in the fridge! The dough was pretty easy to work with (I had to roll it out, let it rest a few minutes, and then roll some more… but it wasn’t too difficult.) I got 13 pockets out of it. I did mostly ham and cheese, but improvised with chicken, bacon bits, onion, and cheese when I ran out. My husband ate 2 right away, then requested that I not freeze a few so he could have them for breakfast! I really enjoy your blog. I am a law school student (just finished my first year) and just started freezer cooking to save time during the week. My roommate and I are both gluten free, but we’ve been able to follow along with your freezer cooking recipes fairly well with some modifications. Our favorite so far has definitely been these ham and cheese pockets–I made gluten free dough and turkey ham. My roommate loved them so much I had to make another batch to freeze. Thanks so much for the inspiration and easy recipes! Oh, I’m so glad to hear you’re enjoying the recipes! This may be a daft question but did you use fast acting dried yeast (granules) or did you use fresh? I’d love to try these ASAP! Can’t wait! It was dry active yeast that I bought in bulk from Sam’s Club (and store in my freezer). These are great! Made them tonight for dinner and threw the rest in the freezer. YUM! My husband already wants me to experiment more with them. HEY! Made these and my husband said they were great. Shared it with a friend who enjoyed them as well. She did 1/2 whole wheat flour and said they still came out delicious! So I will for sure try that out next time. I also plan to try some flavored crust like garlic parm :). 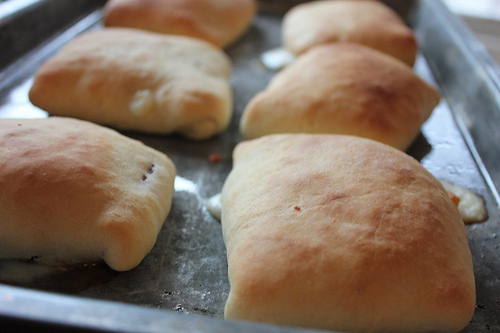 this is a super silly question, but do you let the dough rise after you knead it? I plan to use the bread machine. I can take it out after it mixes, but my dough cycle includes a rising time. Thanks! Go through the entire dough cycle – I have a dough cycle that lasts about 45 minutes. Hope that helps! I dont have a bread machine. Does this mean you let it rise for 45 minutes? I have tons of pizza dough in my freezer….could I use that instead of buying the ingredients to make my own?? Looks delicious and can’t wait to try it! My husband and I LOVE this recipe. We make a bunch and freeze them. They heat up in the microwave so fast (1 minute max) and save so much time during the week. We are both schooling full-time and working, so these are a life saver! We have tried adding Italian seasoning to the dough and covering the pockets with garlic powder and parmesan cheese before baking. Super delicious, and so much better than Hot Pockets haha. Thanks so much for this post! If I am making the dough by hand, should I let my dough rise after I knead it? I think you would let the dough rise just like it would on a dough cycle in the bread machine. What kind of cheese do you recommend?? I’ve made this recipe several times now. I use my stand mixer to knead and I never let it rise, they always come out great! I live this because it can (and almost always is) an impromptu dinner. Thanks for the recipe. Can you use those frozen Rhodes bread or rolls to do this instead of making the dough from scratch? I haven’t looked through all the questions and comments cuz I’m sure someone has asked… can I substitute the dry milk? I literally have no other use for it and it’s not like you can buy it in small quantities. Thanks! Quite a few bread machine recipes call for dry milk, so might not be a horrible thing to have on hand. 🙂 However, if you don’t have any, I’m told you can substitute the water for milk instead, and omit the dry milk. I’ve not tried it, however. My husband and I were buying the smuckers frozen PB & J. They are not very big and would not fill him up. I made sandwiches with peanut butter and different fruit spread and jellies, peanut butter and Nutella and peanut butter and honey. We’re excited to try these and save money and time! As we both work long hours, we’re going to start cooking all of our meals on Sundays for the week. We’re excited to try some of your recipes. Thank you for the ideas!